1) What am I trying to accomplish with this piece of gear? Answers to this question typically result from a realization that your current gear isn't working for you. They can range from "I need a piece of gear to do ________" to "I want to improve the performance of my gun" to "Because I want to." For example, if you need a piece of gear to mount a flashlight on your rifle, you have several options, each with varying pros and cons. So now we proceed to the next question. 2) What is the intended use and operating environment of this piece of gear? While this sounds similar to the first question, it's not. When you consider use and operating environment, I'm speaking specifically to how hard you're going to use the gear, and if there are any constraints that may affect you. These constraints could be environmental (such as maritime or desert usage) or artificial (departmental policy). Sticking with our example, you know you need a light on your rifle. You have stock plastic handguards that won't easily mount a light. So now you have several options. You can get a product that mounts to the plastic handguards, or mounts on the front sight post. You could also replace the plastic handguards with modular handguards and open up your options even further. If this is going to be a gun that you're going to run hard, mounting to the plastic handguards may not give you the best durability. Mounting to the front sight post may not be as low profile as you'd like. Maybe an MLOK replacement handguard is in order. All these factors will be unique to you. Your answer to this question will probably be different if you're anticipating hunting or competing with your gun than if you intend to rely on the gun to save your life. If it's a duty gun, your department may place restrictions on what you can do to the gun. You may not be allowed to replace or modify the handguards. In our example, that might limit you to a front sight mount, whether you like it or not. 3) What issues might I introduce with this piece of gear? There have been a number of times that I've purchased gear, only to find that adding that new gizmo actually caused more problems than it solved. At the very least, adding new gear or changing out parts can introduce the need to re-train how you do a particular task. Let's say you buy a part to allow you to add a flashlight to your plastic handguard. Most adapters use the ventilation holes in the handguard to attach the light mount. In turn, this reduces the amount of ventilation available to cool your barrel. If you choose to mount on your front sight post, you need to ensure that the mount/flashlight combo doesn't interfere with your line of sight. Just the act of adding a flashlight may require that you change up your grip to allow for flashlight activation. Some of these issues can be predicted and compensated for if you take the time to mentally "mock up" the gear. If you can find a buddy that has a similar setup to try, that's even better. Other issues you won't realize until you have the gear in hand. C'est la vie. 4) What additional benefits might I get from this piece of gear? Any time you can achieve more than one improvement by purchasing a single piece of gear, that's a bonus. While it probably shouldn't be the largest factor in your decision, if it comes down to two pieces of gear of roughly equal quality and price, it should be included. 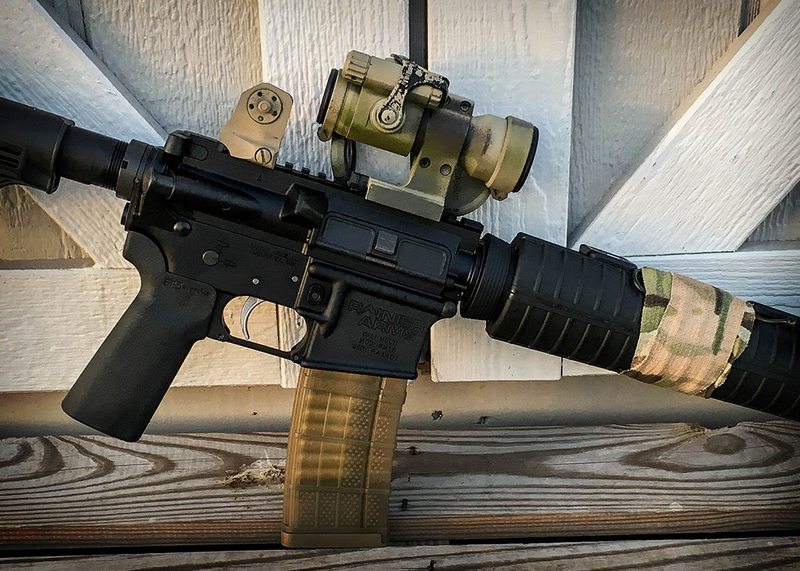 An example would be a adding a modular handguard so that you can mount your flashlight. As a side benefit, you also open up your options for forward grips and possibly slim down the forend as well. 5) What kind of reviews does this product have? It may seem a little backwards to have this as the last question to ask, but realistically, it makes sense. It doesn't matter how great a product is if it doesn't meet your needs. Walk through the first questions and determine exactly what you're looking for. Then, and only then, go out and research what parts that meet your needs have the best reviews. Reviews from people that are using the item in a manner similar to your intended use are always best. If you're asking on a forum or Facebook group, be as specific as possible in describing your need, use, and environment. Narrowing your opinion request down to 1-3 pieces of specific gear is much better than the generic "What is the best?" question. Look for answers that are equally specific. Can they tell you why they prefer the gear they're recommending? Can they describe both positives and negatives? You work hard to earn your gear money, and it's important to you that you spend it wisely. There is no shortage of useful accessories in the gun world. Hopefully, using these five questions will help you put your money into the gear that works best for you.